We've already posted on this video, but it warrants another look. In the recent history of Palm, nothing has been more important to the survival of the company than the gigantic infusion of cash and brain-power that resulted from Elevation Partner's buy-in to Palm. It bought Jon Rubenstein to the table, it added some much needed gravitas to their board of directors, it gave the company the cash and tools they needed to make the Pre happen. 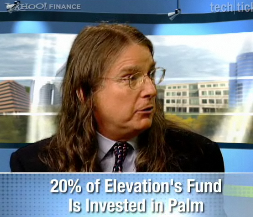 Elevation's most famous investory is U2's Bono, but the heart and soul of the private equity firm is clearly gadget-nut (check out his utility belt in the video after the break) Roger McNamee. He recently sat down with Sarah Lacy to discuss the Pre and how CES2009 was Palm's "Sally Field" moment. But better than that, it does stuff for you. So when you wake up in the morning, it has taken your calendar -- if you ask it to -- and downloaded the maps for you whole day, it's downloaded the wikipedias for the people you're going to visit and the companies you're going to see... Why is it on PCs you have to go and do all that? And when you're late -- get this -- when you're late it -- remember, this things has GPS, it has a clock, and it has your calendar. So it not only knows where you are, it knows where you're supposed to be and when; and so when it realizes you're going to be late, it says "Hey, not only are you going to be late, but I can take care of it for you. I'll send an email to your assistant or to the people in the meeting, which would you prefer? And oh, by the way, here's the map." This is the beginning of a new wave. Sounds pretty good to us. Actually, what has us most excited is that if this sort of functionality is in there and Palm didn't even bother telling us about it during their CES2009 presentation, what other goodies are in store for webOS? Big thanks to Goyena of the TreoCentral forums for pointing the story out!